As a business owner, you want to close every sale, maintain a healthy cash flow, and deliver a good customer experience. And payments play a big role in that. You may feel pressure to accept every type of payment (checks, cash, peer-to-peer apps, or cards) but are torn over the cost of accepting those different methods. So let’s focus in on one method that really divides business owners: credit and debit cards. Consumers are using cards more and more, but business card acceptance is slower to follow. Here’s what you’re missing if you’re dragging your feet to also accept cards. People want convenience. And if shopping at your store means a trip to the ATM, they may skip you over and opt for the competition. Accepting credit cards ensures that you offer the best customer experience possible — which makes people more likely to recommend your business to friends. If you’re a cash-only business, you can see a significant increase in revenue by starting to accept cards. Why? Research shows that 16 percent of consumers do not carry cash, and 85 percent are not likely to withdraw cash to make a purchase. Our own survey found that 35 percent of consumers said that if a business they were thinking about visiting didn’t accept credit cards, then they would look for a different business. That’s a whole lot of missed sales! One strategy to grow your business is to increase your average transaction size. Perhaps it’s because you can’t actually see the money being exchanged in a credit card transaction (as opposed to cash), but people tend to spend more when they swipe than when they use cash or check. In fact, a study by Dun & Bradstreet found that people spend 12 to 18 percent more when using credit cards instead of cash. Consumers are also 12 to 15 percent more likely to always tip with a credit card, and then tip up to 13 percent more. On the conservative end, a business with an average transaction size of $50 would see that transaction size increase to $56 when customers pay with cards. If they make 20 transactions a day, that’s an incremental $120 daily. Business owners tell us that they like cash or checks because it gives them more control over when they get paid. Depositing cash or checks happens on their schedule, so they feel that they can better control their cash flow. But what you may not realize is that credit card processors have made getting paid a whole lot faster. 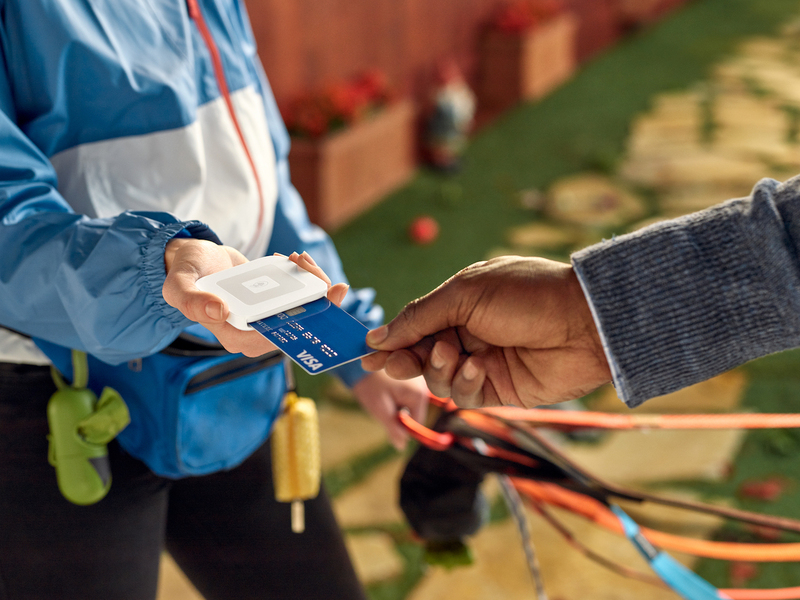 If you accept credit cards with Square, for instance, you see funds in your account in one or two business days. You even have the option to get your deposit the same day or instantly. If your business take a lot of checks, you know that dealing with bounced checks is a hassle — not to mention awkward. You can mitigate some of the back-and-forth and delayed funds by also accepting cards. You know right away if the customer has the funds, and can rest easy knowing the funds are on their way to you. Believe it or not, buyer sentiment is moving to prefer more digital forms of payment, for speed and ease of use. In a recent Visa study, 78 percent of consumers ranked a digital payment method, like a card, as their most preferred payment option. Eighty-nine percent of consumers identified convenience as a top benefit of digital payments like cards, while 79 percent noted how cards save time in comparison to cash and checks. Another benefit? Accepting cards may show customers that your business is legitimate. If you have logos at your register of all the major cards you accept, it’s likely to instill a sense of trust with people, which will make them happier about purchasing from you. Bottom line, there are many ways to get paid quickly, in a way that’s simple for your customers. Accepting many different kinds of payment methods helps make sure that you’re a viable option every time for your customers, no matter what they have in their wallet. How Do Credit Card Readers Work? Get your free Square Reader. No contracts, clear pricing, and fast deposits.